To date, not one business group or peak body has opposed the Capital Metro public transport infrastructure project supported by popular vote at the 2012 Assembly election. On 28 September 2015, three leading business groups sent a jointly signed letter to the Canberra Liberals urging them to abandon their anti light rail stance. Business Council of Australia chief executive Jennifer Westacott, Infrastructure Partnerships Australia chief executive Brendan Lyon and Australian Industry Group chief executive Innes Willox​ have co-signed a letter to the Canberra Liberals urging them to reconsider their strategy. damage economic development in the territory. The letter comes after federal Assistant Infrastructure Minister Jamie Briggs warned the Canberra Liberals not to cancel contracts after the 2016 election, describing it as "economic lunacy". The letter has been reported on in the Australian Financial Review here, ABC Online here and the Canberra Times here. IPA chief executive Brendan Lyon said Australia needed investment to fill the infrastructure gap and grow the economy beyond the resources boom. He said voiding light rail contracts would damage the national interest, and cost Canberra dearly in compensation. "Australia has a hard-won reputation as one of the world's safest places to invest, but the axing of Victoria's East West Link contract has already damaged that standing,"
"We have no tradition of incoming governments using their lawmaking powers to dud businesses by avoiding their legal obligations under contracts. "These sovereign-type risks are usually associated with countries with weak formal institutions, not modern global economies like Australia." "As we have seen with the East West Link disaster in Victoria, tearing up legally binding infrastructure contracts raises sovereign risk, damages investor confidence and stifles economic growth,"
The three business groups warned that cancelling the light rail contracts would only make infrastructure projects more expensive. "While we respect your principled opposition to the Capital Metro project itself, we note that a valid contract will be in pace – and construction underway – well before next year's election,"
"If the light-rail contract was cancelled, the cost and risk of doing business in the Territory would rise. It is in the ACT's own interest to avoid sovereign-type risks in Australia's infrastructure market." "Australia's executive governments have long observed a tradition -– with some regrettable exceptions – of respecting contracts entered into by their predecessors, even where such contracts prove politically inconvenient,"
"This provides the basis for businesses of all sizes to work with government without fear that political change might see arrangements change, bills unpaid or contracts cancelled." "Cancelling multi-million dollar contracts is a false economy, because investors and contractors will factor in the costs of sovereign risk into Canberra's next project – and all the ones which follow." Mr Lyons said he was not sure the Canberra Liberals were aware of the damage they were doing internationally to Australia's reputation for infrastructure investment. "The process of writing to bidders saying such things has triggered alarm bells in Paris, Sydney and across the world,"
"It is entirely their right and obligation to question large-scale spending decisions by the government but there is a strong tradition of not engaging and causing sovereign risk." "It is in the ACT's own interest to avoid sovereign-type risks in Australia's infrastructure market, we respectfully urge you to reconsider this policy." 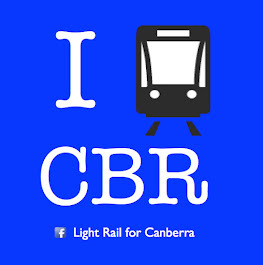 The Chief Minister loves light rail!